Matchbox Lesney Dump Truck NO 28. Very good boxed condition with sealed mirror accessories. Box is very good and model number 19-3214. Length = 45 mm. 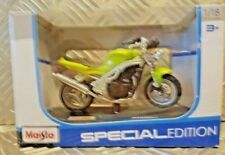 Most of our toys are given a condition grading consisting of 2 letters. The first refers to the model and the second refers to the box i.e. A/B. Produced to = 1969. Produced from = 1963. Tomica #76 Isuzu Giga Dump truck Mint with box see photos . I always combine shipping . Buy multiple cars and pay shipping for price of single car postage on all UK orders International orders will be ppsted by royal mail international postage. If you like to purchase more than one lot please email first for combination postage. Play worn as per photos. These are my own personal gradings which may differ from yours. judge for yourself the condition of the item. GOOD= Complete but with heavy wear and tear. VERY GOOD= Complete but with more signs of tears and creasing. 1/ Scale Model by CONRAD. The BOX is in GOOD condition - Worn. Our aim is to ensure no matter what the model, we will provide an excellent service experience. The RM Toys Team. Kind Regards. MINT - The item is in perfect condition. Colour: Pea Green. Base Variation: Matchbox Series (A). Wheel Arches: n/a. Wheel Type: 14.1 mm x 5.3mm Wide Spiro Wheels. VERY NEAR MINT - Almost perfect with only minor creasing, minor corner wear. VERY NEAR MINT - Almost perfect with only most minor of imperfections/rub marks, may have one or two nicks. Colour: Bright Pea Green. Base Variation: Matchbox Series (A). Wheel Arches: n/a. Wheel Type: 14.1 mm x 5.3mm Wide Spiro Wheels. GOOD= Complete but with heavy wear and tear. VERY GOOD= Complete but with more signs of tears and creasing. Base Variation: Matchbox Series (A). Wheel Type: 14.1 mm x 5.3mm Wide Spiro Wheels. Wheel Arches: n/a. VERY NEAR MINT - Almost perfect with only minor creasing, minor corner wear. USED= Item will be in need of restoration or for spares/ repair, broken and/or missing parts. Base Variation: Matchbox Series (A). Colour: Military Green. Wheel Arches: n/a. Wheel Type: 14.1 mm x 5.3mm Wide Dot Dash Wheels. VERY NEAR MINT - Almost perfect with only minor creasing, minor corner wear. Playworn condition, missing rear wheels. Colour: Dull Pea Green. Base Variation: Matchbox Series (A). Interior Colour: n/a. Wheel Arches: n/a. Wheel Type: 14.1 mm x 5.3mm Wide Spiro Wheels. GOOD= Complete but with heavy wear and tear. VERY NEAR MINT - Almost perfect with only most minor of imperfections/rub marks, may have one or two nicks. Model:- MBX TR 8800 Dump Dozer. Series no:-MBX CONSTRUCTION #24/120. 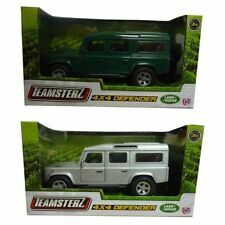 Make:- MATCHBOX 2014 Case C. Colour:-Green with White bucket. ALL cars are sent in a box not a jiffy bag! Card:- Short. £3.50 £0.25p for each extra car. This mini Tractor and Dump Truck set is ideal for outdoor sandbox fun. 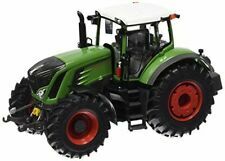 The tractor features a working front loader to dig and scoop, whilst the dump trucks tipping action tips away the load. Ideal for outdoor sandbox play, the Big Scoop Dump Truck features easy tipping action and free rolling wheels for simple transportation. This was originally the property of Dr Edward Force who wrote many reference books on Corgi, Dinky and Matchbox toys in the 1980s and this example may well have appeared in one of these books. He catalogued all of his models with a reference number on a sticker on the base which I believe relates to the plate number in his books (this label could easily be removed by the new owner without leaving a trace if preferred). Perfect for display on your dashboard, desk, or shelf. Also good for 00 gauge model railways of contemporary design. 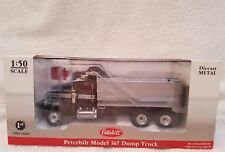 2x MATCHBOX 1:75 SERIES DUMP TRUCKS -- MB6 EUCLID - 10 WHEELED ISSUE MB28 MACK - RED WHEELED ISSUE - AS PHOTO. MODEL CONDITION -- FAIR TO GOOD - SEE PHOTOS. The row above plus £2.50. £50.01 to £250. £20.01 to £50. Total value 1501g - 2000g. 1251g - 1500g. 1001g - 1250g. 751g - 1000g. MBX TR 8800 Dump Dozer in Green & White with "MBX Mining Co." printing (#24 of 120). Model is Mint and Unboxed. Lesney Matcbox Superfast no 58e Faun Dump Truck. Good average condition – A few signs of usage to paintwork, axles all ok. Quite presentable. I can do better prices for combined orders. 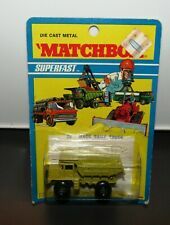 Matchbox Superfast No58 Fauno camión, (1976), hizo Inglaterra Lesney, ver fotos. This item is exactly as you see in the pictures. John Deere Dump Truck. Length: 41 mm. Back of truck lifts and tilts. Mint in original box - box has the original sale date written by a previous owner inside the lid. Or it can be perfect as pictures. If the pictures were taken on the green board - Every square equals to 1 cm. Nous parlons français. language only. Small parts might detach from the item - they can be glued back. The item is very heavy and fragile. I don't know which parts are missing or the item is complete you will receive it as pictured. If the pictures were taken on the green board - Every square equals to 1 cm. Need help hauling a big load while helping save the planet?. The sturdy Green Toys Dump Truck is ready to get working. Like all Green Toys products, the Dump Truck is made from 100 percent recycled milk jug plastic. Made in the USA from 100% recycled plastic milk containers, the Green Toys pink dump truck is ready for any task, hauling sand and rocks or dolls and diamonds with ease. No BPA, phthalates, PVC, or external coatings, but loads of good green fun! The sturdy Green Toys Dump Truck is ready to get working. Like all Green Toys products, the Dump Truck is made from 100 percent recycled milk jug plastic. Height: 180mm, Width: 254mm, Depth: 190mm.